Trending at AU $1,013.68eBay determines this price through a machine-learned model of the product's sale prices within the last 90 days. A lot of my favorites shots were taken with this lens. No focusing issues - lens works perfectly. Sony 16-70MM F4 ZA OSS E-Mount Lens. Condition is Used. A very versatile zoom lens that's great for travel and even performs well in low light due to the built-in OSS. Excellent condition , light paint paint fade around the edge focus ring but it's purely cosmetic. For Sony APSC E-mount. Sony Zeiss Distagon T* FE 35mm F1.4 ZA E-Mount Lens. In EXCELLENT condition. Sony Zeiss Distagon T* FE 35mm F1.4 ZA SEL35F14Z E-Mount Lens . I purchased this in May 2018, however I have used it less than a couple of times and realized that I don't use 35mm that much. This lens is in excellent condition. It will be sent with Australia Post Pre-Paid Parcel Post Satchel 3kg. 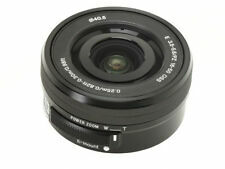 5 out of 5 stars - Sony Zeiss Distagon T* FE 35mm F1.4 ZA E-Mount Lens. In EXCELLENT condition. 2 product ratings2 product ratings - Sony Zeiss Distagon T* FE 35mm F1.4 ZA E-Mount Lens. In EXCELLENT condition. Lens is in good used condition and glasses are clean and free from scratch and fungus. There is small dust inside the lens which is normal for a lens of this age. Aminimium focal length of only 10mm lets you capture striking interior shots as well as dramatic landscapes. The F4 maximum aperture remains unchanged even when zooming, you can adjust depth of field more freely. Barely used lens. There is a small mark on the glass. See 2nd pic. MPN SEL2870. Featuring OSS image stabilisation and maximum aperture of f3.5 (f5.6 at full zoom), the lens enables impressively bright and sharp image quality. (Sony SELP1650). Check out the Sony E PZ 16-50mm F3.5-5.6 OSS Lens's Key Features. Built-in OSS (Optical SteadyShot™) image stabilisation. 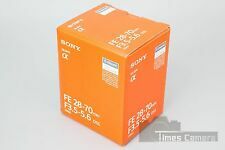 Sony E PZ 16-50mm F3.5-5.6 OSS Lens. OURS DOES! Genuine Australian Sony Warranty. Eyepiece Cup. Autofocus Points. Viewfinder Type. Viewfinder Size. Viewfinder Pixel Count. Viewfinder Eye Point. Viewfinder Coverage. Viewfinder Magnification. Glasses are clean from scratches and fungus, only small dust inside which is normal for a lens of this age. AF and MF all working properly with no issues. Serial number #3570. Original box and manuals. Condition is Used, one small dent, not affecting the operation of the lens. O468 775667. This optic is quite fast for its class with an f/2.8 maximum aperture which will help users work in low-light conditions. It also uses an Ultra Multi-Coating and integrated lens hood to minimize the impact of flare and ghosting in your photographs. Trending at AU $829.35eBay determines this price through a machine-learned model of the product's sale prices within the last 90 days. Samyang AF 24mm F2.8 FE (Sony E) Lens (Sony E Mount). Autofocus with Manual Focus Override. D-SLR Lens. Australian based warranties including both labour and part. It's equivalent to 1 year Manufacturer warranty. SONY E PZ 18-105 mm F4 G OSS 1 x SONY E PZ 18-105 mm F4 G OSS. SONY E PZ 18-105 mm F4 G OSS. SONY E PZ 18-105 mm F4 G OSS Cleaning Kit. ���SONY E PZ 18-105 mm F4 G OSS. Aperture Range F4 - 22. Minimum Aperture (F) 22. As an update to their AT-X 116 PRO DX, Tokina has improved the multi-layer coatings to minimize light reflection and improve optical performance. Tokina AT-X 116 PRO DX-II 11-16mm f/2.8 Lens. An ultra-wide angle autofocus zoom lens with a fast constant f/2.8 maximum aperture. Trending at AU $3,410.31eBay determines this price through a machine-learned model of the product's sale prices within the last 90 days. A compact, lightweight design makes it manageable for active shooting. - Sony Nano AR Coating to eliminate flare and ghosting. - Premium G Master Series wide angle zoom lens and smooth bokeh. Here is the full details of the lens. I always take fantastic care of them — you won’t be disappointed. Check out the Sony E 10-18mm F4 OSS Lens's Key Features. Introducing the super wide-angle zoom lens, the Sony E 10–18mm F4 OSS. From expansive landscapes to striking interior shots with dramatic perspective, capture it all with total precision – even in low-light conditions. (Sony SEL50M28). Check out the Sony FE 50 mm F2.8 Macro Lens's Key Features. 50 mm standard 1:1 macro lens. Get close for spectacular macro. Sony FE 50 mm F2.8 Macro Lens. A focus-mode switch can be used to quickly switch between manual and auto focus, adapting easily to any macro opportunities that arise. (Sony SEL1635GM). Check out the Sony FE 16-35mm F2.8 GM Lens's Key Features. F2.8 Aperture. A compact, lightweight design makes it manageable for active shooting. Fast, precise autofocus. Fast, high-resolution F2.8 16-35mm zoom. Trending at AU $1,757.47eBay determines this price through a machine-learned model of the product's sale prices within the last 90 days. Trending at AU $1,032.69eBay determines this price through a machine-learned model of the product's sale prices within the last 90 days. ZEISS Batis 85mm f/1.8 Lens for Sony E Mount, EXCELLENT CONDITION! BOXED!